Brain Waves Issue 12: It's Been a Year—Thank You! Campus Sonar has accomplished a lot in a year—and we can't wait to keep going! Read Liz's review of The Wave and customer service key tips. Y'all, it's been a year. You could read that sentence in a variety of ways. Literally, it's been one year since we launched Campus Sonar, and 371 days since Emily and Amber joined me on this wild ride. We've done a lot in a year! Because I'm a little behind in popular culture, I didn't discover Hamilton until this year. The soundtrack seems to speak to me at all the right times, reminding me to not throw away my shot, that it's better to be divisive than indecisive, to write like I'm running out of time, to take a stand with pride, and that I am the one thing in life I can control. Now that you have the soundtrack stuck in your head, take a moment to reminisce on our first year in our video look-back. But also, it's been a year. Our business is about people, and people do more than just work. We value transparency so I'm going to be real for a minute. We didn't celebrate on our one year anniversary (October 6), because I was with my family celebrating the life of my mother- and father-in-law. We lost them both in the last year, separately and unexpectedly, over a nine-month period that included ICUs, brain surgery, and hospice. Amber finished her first year of business school. Emily bought her first home. Five new team members joined us, but one left. Other team members also had challenging personal circumstances, but that's not my story to tell. Suffice to say, we've been through a lot. In addition to the current Sonarians, there is a supporting cast behind the scenes that helps us share our story and knowledge with the industry. A large part of the last year was you: our subscribers, supporters, partners, and community. You've been generous with your feedback, encouragement, and advice. You've provided opportunities for us to demonstrate our value and educate the industry. I've had the chance to thank many of you personally, but to those I haven't yet: THANK YOU. We're all in this together, and I know we're all looking forward to the next year. This week’s #BrainWavesBlog post shares advice from higher ed social media managers who are working to implement customer service processes. Learn from Jeff Stevens from UF Health, Lisa Catto from Western Oregon University, and Hillary Green from The University of Texas that the key is to be proactive and collaborative. Get started with our eight quick tips, then read Donna Talarico’s blog post "Social Service—Meeting Customers Where They Are" tomorrow, 10/10. Formalize a customer service/social media protocol (like a response matrix/flowchart). Create a reference guide for social media managers outlining answers to top questions and links to common resources. At the beginning of new academic years, reach out to key areas (financial aid, business office, etc.) for changes in policies, processes, resources, and update “templated” answers to reflect changes. Identify points of contact in other departments/offices to which you’d elevate social questions/concerns. Use recurring questions and trends to inform internal changes, such as updates to web content, rethinking cumbersome processes, consolidating information and services, etc. Keep a log, even if informal, of customer service inquiries and how they were handled, and if someone followed up, etc. Revisit roles and responsibilities of social media managers (and overall comms teams) to see how departments can more effectively provide customer service; this may involve redefining positions, creating new positions, or exploring cost-effective tools to help when adding to staff is not possible. Q: What unusual training/resource/course would you recommend taking or reading up on that would help us get a better grasp on social listening or an aspect of it? For example, does knowing a certain type of math help with writing out queries or checking out Google Trends regularly, etc. A: The Sonarians had some great suggestions for resources and training that might help you better understand social listening. A course in logic would help any beginner in untangling the complexity of query writing. A logic course would also provide a solid foundation for analyzing the data collected (post query-writing). Having a solid understanding of first-order logic has certainly gone a long way to help the Sonarians quickly get their bearings. Pew Research Center’s survey on Americans’ Social Media Use in 2018 determined online platform usage by demographic groups. When performing social listening analysis, keeping this study in mind helps us understand who is represented in the data for a specific platform and who is underrepresented. For example, Twitter use is highest with 18-29 year-olds. When reporting client mention volume on Twitter, a higher volume of mentions from prospective and current students vs. alumni may simply be because the majority of prospective and current students fall into the age group that has higher Twitter usage. A solid understanding of math and knowing a world language help us practice logic and can be useful when building queries. Think order of operations for constructing a formula or a sentence! With both, you have a goal of what you want to express and a number of tools to help you—like mathematical operators or verb conjugation and agreement. Have more social listening questions for our analysts? Send them to info@campussonar.com. Like a kid at Christmas, I settled into my airplane seat on the way to NACAC with the 2018 Forrester Wave™ Social Listening Platforms Report … and Delta's finest selection of red wine because I’m a classy girl. This semi-annual report provides a hot take on the major players in the enterprise market for social listening software. The Wave™ is a proprietary market assessment visualization that considers the strength of current software offerings, the strategic direction of each company, and their market share. The result is a pretty picture that fits on one page and plots tens or dozens of competitors in a particular software niche. Here's my hot take on their hot take. First, it's nice to see that we're all on the same page. Here's how Forrester defines the class of software considered in this report: "Social listening platforms manage and analyze customer data from social sources and use that data to activate, measure, and recalibrate marketing and business programs." But that's about where the niceness ends. The analysts then read the riot act to an industry that hasn't extracted enough relevant business insights from unstructured social data. The Forrester analysts' commentary on the current offerings can best be summarized as "meh." In 2016, they foretold of great potential for the social listening industry, and in 2018 they're "still holding their breath." They want to see software platforms do more to integrate organizational data with social data and use social listening insights outside of the marketing sphere. You know what? I do, too. That's why Campus Sonar exists. I don't want software companies to tell organizations what data belongs together to reveal insights with strategic impact. This is a people problem, not a software problem. In the foreseeable future, it's going to be solved by real human brains, not AI-driven software tools. Forrester warns, "brands should be wary of over-exuberant AI promises and understand that social listening platforms still require humans to train the data in a semi-supervised environment before becoming operational." YES! I agree, but don't see this as a downside. By the time I'm ready to retire, the robots might be crafting our strategy, but we're not there yet. I think we should be happy about that, because Siri and Alexa still have a lot to learn. Another little nugget in the report that might be relevant to higher education came from the 43 client interviews Forrester conducted for this analysis. Enterprises are still looking for the social data cure-all; brands told Forrester that they often start their RFP process by looking for a tool that offers both social listening and social publishing. That's short-sighted. It's a mistake to think that two functions are related simply because they share the word "social." The Wave™ provides a summary analysis of ten social listening software platforms. I won't include references to that analysis here, as it’s proprietary information. If you work for a larger institution, you may have a Forrester subscription and have access to this report. If you identify as "enterprise" (for Forrester that means at least $1 billion in annual revenues or more than 1,000 employees), the analysis may be valuable to you as you consider building your own social listening program. Frankly, I'm surprised they only included ten software companies; there are other strong players in the industry—particularly for small and medium organizations—that weren't mentioned. You may also consider working with us; we offer consulting to help you identify your key business goals that social listening can support, navigate the software landscape, build the foundation of your program, and train your staff. Each month the Campus Sonar staff shares what they’ve been reading, watching, and listening to as it relates to social listening. If you have resources you think might be helpful, send them to info@campussonar.com. 5 Reasons to Go Sherlock and Start Monitoring Competitors Researching your competitors should be one of the key components of your marketing strategy. If you’re doing your own social listening, here’s a how-to on how to monitor your competitors and gain insights. Atonement through Attunement Reviews the state of journalism and higher education in our country and how they’re not equipped to meet 21st century needs. The realization—when you serve people’s needs and pay attention to them, they pay attention to you. Provides a formula for change and how to overcome the resistance. Despite Strong Economy, Worrying Financial Signs for Higher Education Recently Moody’s Investors Service said that 25 percent of private colleges are running deficits and it’s the second consecutive year that expenses have outpaced revenue for public colleges. This, along with changing projections for the number of high school graduates, changing demographics, and a new generation with different needs puts many institutions at risk. Paul Quinn College is trying to change that with a work-college model. Instagram Lead Generation for Higher Education Marketing If your institution is using Instagram, you may want to think about using it as a lead gen driver. Carnegie Dartlet shares the success of using them with undergraduate campaigns. Lotteries May Be the Fairest Way to Fix Elite-college Admissions Are lotteries an admissions fix for elite colleges? This is the latest proposal in response to a lawsuit alleging that Harvard penalizes Asian American applicants. Panicked Universities in Search of Students Are Adding Thousands of New Majors New niche majors such as cyber-security, hip-hop studies, peace education, and embodiment studies are popping up at campuses all over the country—to the tune of 41,446 new degree or certificate programs since 2012. This article examines whether these new majors are attracting new students, or if they’re a panicked reaction to declining enrollment. Liz is keynoting the one-day workshop, presenting Using Social Media Insights to Drive Offline Outcomes. 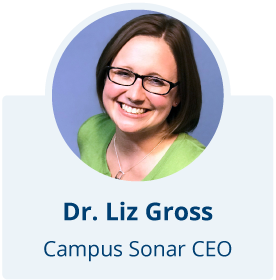 Campus Sonar is a co-sponsor of ListenUp EDU and Liz is one of the many higher ed curators organizing the conference. Join Liz and Amber in one of Chicago’s most creative venues and spend two days creating a 21-st century approach to accelerate student success outcomes, alumni engagement, marketing and communications, and advancement. Register now! If you follow Liz on Twitter, you’ve no doubt been waiting for more on her presentation with Andrew Cassel—Are You Addicted to Data? Balancing Heart and Mind in Your Content Strategy. Join them at HighEd Web! Liz will also present How to Talk to Leadership About Social Listening with Erin Supinka. Campus Sonar is ready to talk to you in booth #504—stop and say “Hi!”—and don’t miss Liz’s extended marketing session with Josie Ahlquist and Gail Martineau on “Trends and Tactics for Higher Ed Executives on Social Media (And the People who Support Them). She’ll share early research from a report on the digital presence of higher ed execs. Stop and see us in the exhibit hall and watch for more information about a presentation Liz is giving with Adam Castro. Brain Waves newsletter is for you—help us shape the news we share with you. Tell us what you think, send us suggestions, and let us know what would help you do your job better. We want to know! Send your feedback to info@campussonar.com or just reply to this email.